Women are so many things in one, a mother, a sister, a boss, a colleague! They do so much, yet we always forget to ask them, what do they really want. This Women’s Day, Sleepwell takes an initiative of finding out 'Who Inspire You'. Post your picture write Who Inspire and how to inspire as women, using the right hashtag Want and tag 5 other people to take part in this movement and get a chance to win an exciting gift hampers from Sanjali. 1. Click a picture with the Iron/ Inspires Woman of your life. 2. Upload the picture on your Facebook, Instagram & Twitter feed and tag at least 5 friends. 3. 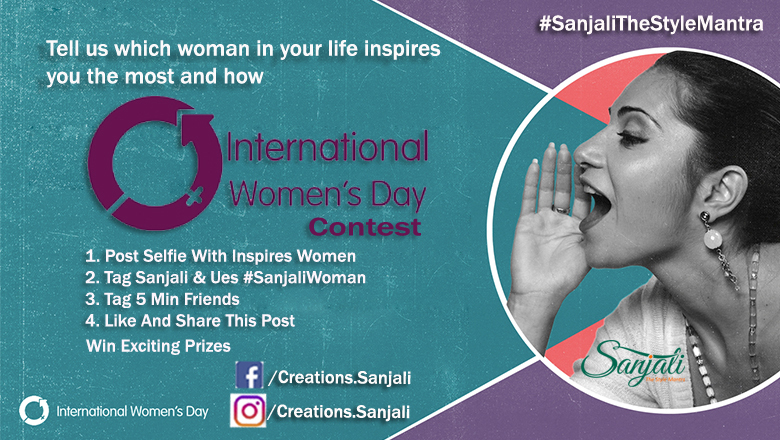 Use #SanjaliWoman #SanjaliStylishWoman #SanjaliKurta #WomenWhoInspire and @Creations.sanjali in the caption to enter the contest. 4. Tell us which woman in your life inspires you the most and how?. Use of unauthorized means to increase likes and comments is strictly prohibited and will lead to immediate disqualification from the contest. If the number of likes & comments on a participant's picture greatly exceeds the number of their followers, they will be considered fake & the contestant will be disqualified. The Facebook, Instagram & Twitter account of the participant should be matured & created minimum 6 months ago in order to be considered as a genuine account to participate. No. of likes & comments on the post will be counted only till the time given for the end of the contest. Relatives & friends of the employees of Sanjali are not allowed to participate in any contest. If found, strict actions would be taken. Once the contest ends, the contestants will have to present their ID cards (valid from before Jan 2016 till date) as a proof of identity.